The 2012-13 tax year will soon be ending which means that those that have not already utilised their annual allowance of £5,640 for earning perpetual tax free interest on savings will lose it. Unfortunately Britain's bankrupt bailed out banks continue to be supported by tax payers and Bank of England rampant money printing to an unlimited extent which via mechanisms such as the Funding for Lending Scheme is impacting severely on savers in terms of depressing UK savings interest rates whilst Quantitative Easing monetization of UK government debt and the financing of fictitious profits that form the basis for bonuses, that are even paid out when the Banking crime syndicate members such as RBS and Lloyds TSB announce losses results in the Inflation stealth theft of purchasing power of savings and earnings. Therefore savers continue to fight a losing battle against government sponsored systemic fraud as they fight to eke out a return that is able to keep pace with official inflation rates which tend to under report real inflation by approx 1.5% per annum. During the current financial year, Cash ISA savers will have seen interest rates peak during May 2012 as rates nudged above 3% for instant access accounts and as high as 4.5% for Fixed rate ISA's as illustrated by looking at how the cash ISA rates at the tax payer bailed out bank, the Halifax have trended this year which is typical of what is taking place right across Britain's Cash ISA 'artificial' savings market. 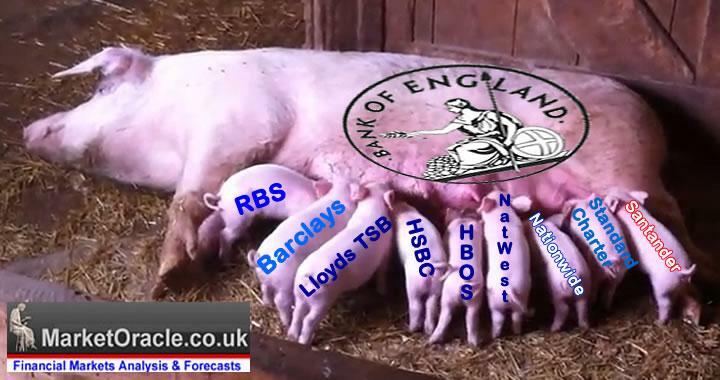 Therefore the cash ISA savings rates are just so bad that none of the crime syndicate that masquerades as our banks deserves mentioning, instead probably the best strategy is to wait until early next year as the best rates tend to materialise during March and April of each year i.e. to coincide with end of tax years and start of the following years, therefore it maybe better to either wait or opt for an instant access ISA now, in which respect the rates are still catastrophically poor so again not worth mentioning. The reason for the crash in UK savings interest rates can be put squarely at the Bank of England's Funding for Lending Scheme that was announced in July 2012 that sought to provide the Banks with cheap money to entice lending to the general public that will total an estimate of £80 billion over the 18 months of the scheme. The effect of which is that Banks are able to rely on Bank of England / UK Treasury funding for loans instead of Savings and thus savings interest rates crashed. This is but the latest measure adopted by Government institutions to steal wealth from savers to benefit the banks and debtors. What this means is that wen the funding for lending scheme ends in about 9 months time, it will either be extended or replaced by an even more fraudulent scheme. The Bankster of England is already cooking up several Baldrick-esk cunning plans such as Deputy Governor Paul Tucker's suggestion for Negative interest rates! Baring in mind the ongoing systemic fraud perpetuated against savers, the following represent the least loss of purchasing power against an estimated real inflation rate of 4% that at least protects against the 20-40% tax on savings. Another point to consider is that most instant access ISA's taken out a year ago will likely be seeing their 12 month bonuses end, so this is a good time to review and plan to move existing ISA's ahead of expiry of bonus rates. NS&I 2.25% £100 Does not allow transfers in, rate completely variable i.e. could be dropped within a month! Coventry BS 2.8% £1 60day notice account. Includes a 0.6% bonus for 12 months. No transfers in. Metro Bank 2.25% 1 Year £1 Allows transfers in. Halifax 2.5% 2 Years £500 Allows transfers in. Early withdrawals allowed subject to 180days loss of interest. Halifax 3% 3Years £500 Allows transfers in. Early withdrawals allowed subject to 270days loss of interest. The ISA accounts are TAX FREE, and do not have to be entered onto any tax returns. The equivalent taxable return on a 3% cash ISA for standard rate tax payers is 3.6%. For higher rate tax payers it is 4.2%. The income from tax ISA's does not count against many mean tested benefits such as Tax Credits. The Allowance for 2012-13 is £11,280, £5,640 for cash and £5,640 for shares ISA's or the whole £11,280 into a shares ISA. You can only open ONE New cash ISA per tax year, and you can add new monies to One Cash ISA per tax year (see transfers). Similarly you can open only one new Shares ISA per tax year. You do not have to open a Cash ISA with your existing provider, i.e. you can open an account at different providers every year. Most providers allow for transfers in. And ALL should allow you to transfer out. Once you withdraw from a Cash ISA you cannot then then re-deposit into. The £5,640 limit refers to total deposited, and not maximum account balance. So if you deposit £5,640, and withdraw £1000, then you cannot re-deposit that £1000 in the same tax year as you have used up your £5,640 deposit limit. To maximize your tax free interest, it is best to open your account at the start of the tax year. The Financial Services Compensation Scheme (FSCS) guarantees the first £85,000 (Euro 100,000) per person, per institution. Those with sizable savings that total more than £85,000 should ensure that their institutions really are separate, especially given the banking crisis forced mergers. There is the facility to transfer Cash ISA monies into Shares ISA's but NOT from Shares ISA's to Cash ISA's . Next years Cash ISA allowance (2013-14) will increase inline with CPI inflation and will be £5,760. To be in receipt of ongoing strategies on how to protect your wealth from ongoing Inflation theft, ensure you remain subscribed to my always FREE newsletter. Copyright © 2005-2013 Marketoracle.co.uk (Market Oracle Ltd). All rights reserved. Nadeem Walayat has over 25 years experience of trading derivatives, portfolio management and analysing the financial markets, including one of few who both anticipated and Beat the 1987 Crash. 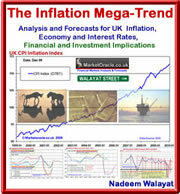 Nadeem's forward looking analysis focuses on UK inflation, economy, interest rates and housing market. He is the author of four ebook's in the The Inflation Mega-Trend and Stocks Stealth Bull Market series.that can be downloaded for Free.